Unless you build a new home, you probably have little control over the shape of your bedroom or location of its closet or dressing room. You can still create a cozy, comfortable room by combining light, view, layout and circulation. A bedroom with an efficient design and of well-organized space provides an enjoyable environment for a good night’s sleep. If you build new or remodel your home, first, think of the room’s circulation when designing it. Circulation refers to the paths of travel in a room. Strive for a circulation design like that of a hotel room. It provides one clear path from the adjacent bathroom to the bed and further to a writing-table or dining table. The television sits across from the bed and nightstands flank either side of the bed. This provides a clear, straight path of travel through the points of the room. A closet across from the bathroom creates an efficient design. Provide yourself a lovely view. Include a window or two overlooking the backyard or a more exciting view if you have it. Try to make the view, not the bed, the first thing you see upon entry. If you can, connect the room to the outdoors with patio or French doors. Placing your bedroom on the corner of the house provides at least two walls of window space. Windows provide ventilation and light. Design with privacy as a priority. Don’t site bedrooms across from family rooms, great rooms or kitchens. Remove the bedrooms from high traffic areas using a foyer or hallway. Design with a designated bed wall. Also, design for the furniture you’ll need to place. In an existing home, you work with the space you’ve got. Organize your furniture as efficiently as possible. Layout the room for optimal circulation with the bed against one wall. Leave space on either side of the bed for night tables. Think about hanging your television. Both static and adjustable mounts are available. This saves space in smaller rooms and makes viewing from bed easier. Try to provide yourself a view upon entry, but if it’s not possible to see a window upon entry, hang a painting on the wall opposite the entry. At night, close blinds, curtains or shades, so you maintain a darkened room until your alarm sounds. Open window covers let light in as the sun rises which may be before your alarm. 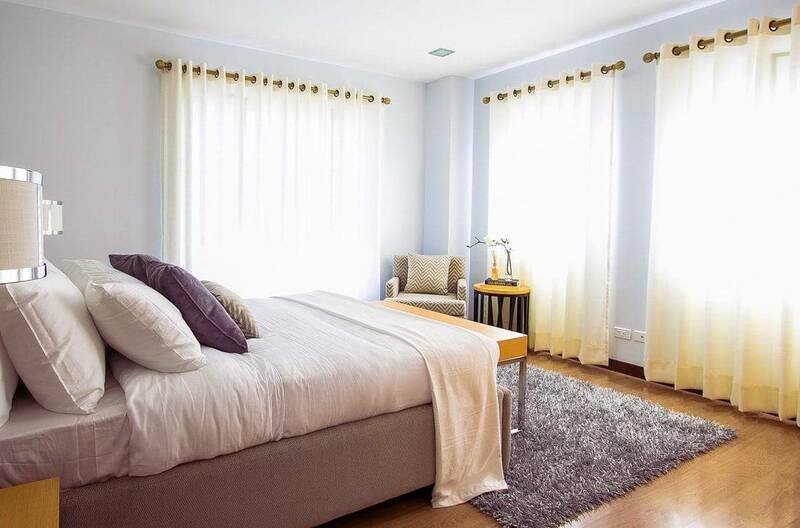 Open the window dressings upon waking to enjoy a healthy, natural light. Organizing your bedroom and controlling light entry can help you enjoy time spent there, especially sleep hours. You can get a better night’s sleep in an optimally designed room. Contact us to sell your home and find the perfect place to lay your head.